Alejandro Grimaldo scored a superb 25-yard free-kick to send Benfica out of the Champions League on a high after a 1-0 win over 10-man AEK Athens. Marinos Ouzounidis' side lost all of their previous five group games and went into the clash at Estadio da Luz having lost four of their last six matches but they successfully kept Benfica at bay for 88 minutes. Benfica coach Rui Vitoria will have been disappointed to see winger Rafa Silva leave the field with an injury in the first half, not to mention the wastefulness of his forwards when presented with numerous early chances to score. 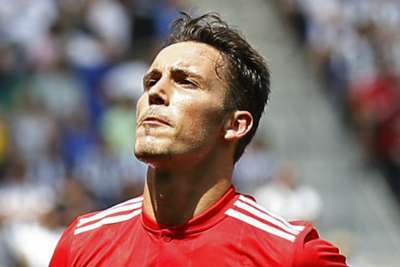 But after Konstantinos Galanopoulos was sent off for a second bookable offence, Grimaldo stepped up to curl home a goal worthy of winning a better game than this dead rubber between two sides whose elimination from the competition was confirmed before kick-off. The Greek champions cut a frustrated side in the first half but for all their early dominance the Eagles failed to threaten an opener aside from Jardel's header past the post after four minutes and Grimaldo's free-kick that curled wide 10 minutes later. A shanked ball just inside his own half by AEK's Ezequiel Ponce allowed Haris Seferovic to go through on goal moments before half-time but the Swiss forward lashed the ball wide from 20 yards. Marios Oikonomou appeared to hold Ruben Dias' shirt as he jumped to head a corner early in the second half but the referee allowed play to go on and AEK had their best chance to break the deadlock when Oikonomou leapt to meet a corner but headed narrowly wide. Seferovic tested Vasilios Barkas with a first-time shot from Franco Cervi's low cross, the goalkeeper getting down well to parry the ball away and the Swiss forward hit the crossbar with a free header moments later to compound his frustrating night. Gedson Fernandes was denied in a one-on-one with Barkas shortly before Galanopoulos fouled him to earn his second yellow card, and Grimaldo's left-footed strike settled the match before Seferovic rattled one last shot off the crossbar and the post in the dying moments. Fourth-placed Benfica are just four points off the pace in Portugal's Primeira Liga and will feel they can push for the title and compete in the Europa League, while AEK can focus on their Greek Super League campaign. The story of the night would have been Benfica's missed chances had Grimaldo not illustrated the quality in his team with a memorable match-winning goal. AEK's approach to the game was always a physical one, but there was little need for Galanopoulos to be making rash challenges so late when his side were clinging on for the only Champions League point of their campaign. - Benfica earned their first home win in six Champions League games, since beating Borussia Dortmund in February 2017. - AEK failed to register a single shot on target in a match for the third time in the Champions League this season. - AEK have failed to score in nine of their last 12 away matches in European competition since the start of 2016-17. - No player had more shots (5) or more shots on target (4) in this game than Benfica's Alejandro Grimaldo. - Grimaldo’s winner was Benfica's first Champions League goal from a direct free-kick since Anderson Talisca versus Bayern Munich in April 2016. AEK face Larissa as they push for a place in the Super League's top two, while Benfica travel to struggling Maritimo.